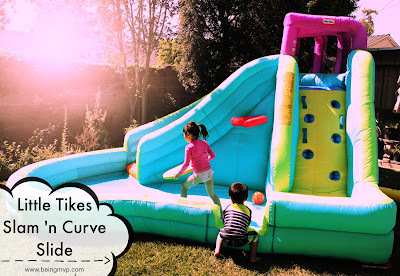 Disclosure: I received the Slam 'n Curve Slide for review from Little Tikes. All opinions are my own. Kenzie has been asking for a water slide for some time now so I was excited to surprise her with the Little Tikes Slam 'n Curve Slide. 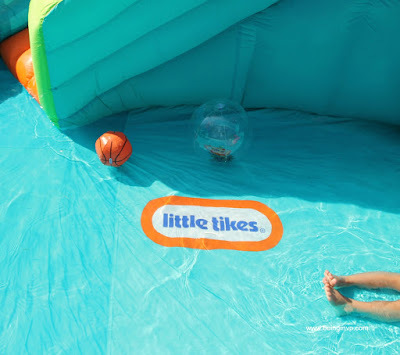 It is the perfect backyard inflatable for the summer that will keep your child(ren) entertained and screaming with glee. 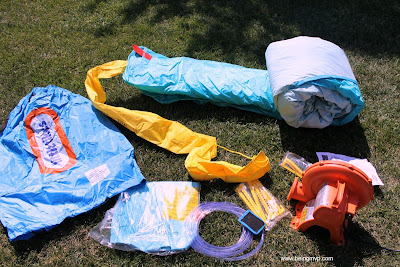 The setup was fairly simple - take out of box, roll out on ground, plug in blower, place stakes into ground, velcro strap water tube to side and connect to hose, turn on blower and then water. It literally took about 10 minutes before the kids could start playing. I love the clever design of this slide as it very kid friendly. The climbing wall is similar to the playground one and Kenzie was an expert in getting to the top of the slide where the water sprays out over the top to enhance the trip down. Since the spray is connected to the top of the slide with velcro, you can easily angle the direction of the water if your child is picky. The curved slide is so much fun and once Mason got over the fear of sticking his feet in the climbing wall, he was non-stop on the slide and even passed up Kenzie to get in front of her! The wading pool feature is smart. It is like a mini-pool that your child(ren) can lounge in, practice surfing, sun bathe and even dance in. After coming back from a long vacation in FL with swimming in grandma's pool everyday, the kids definitely enjoyed swimming again back at home. 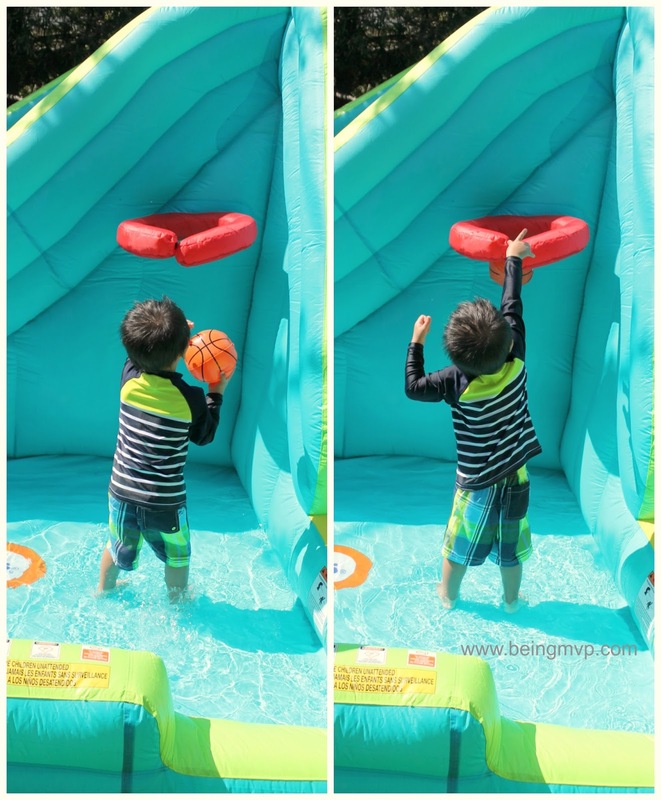 The inflatable basketball hoop and ball provide friendly competition with the kids. They can practice their shot and rebound and when the competition gets rough, go grab another ball for play. Kenzie and Mason didn't want the fun to stop even after a few hours but dinner was calling. The breakdown took a bit more work than setup but wasn't difficult at all. Just turn off the blower, tilt out the water, blow back up and face towards sun to dry out and then roll up to store for another day of play. *Note that the blower needs to continuously be running while the slide is in use. 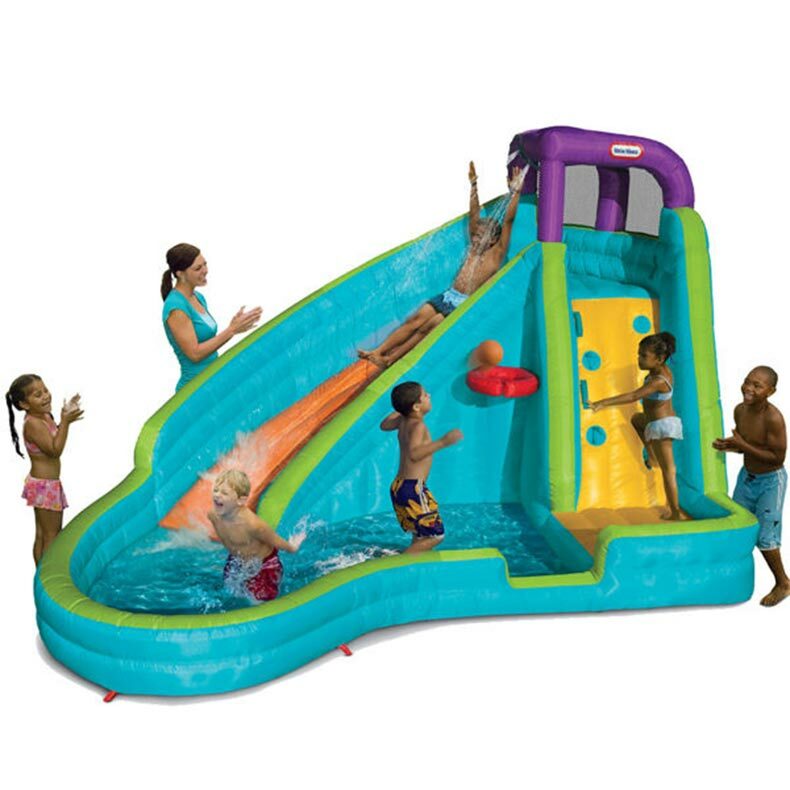 This is a durable water slide that several children can enjoy at once (maximum combined weight 350 lbs). It will definitely be wonderful for summer play dates as well. Would your tot enjoy the Little Tikes Slam 'n Curve Slide this summer? 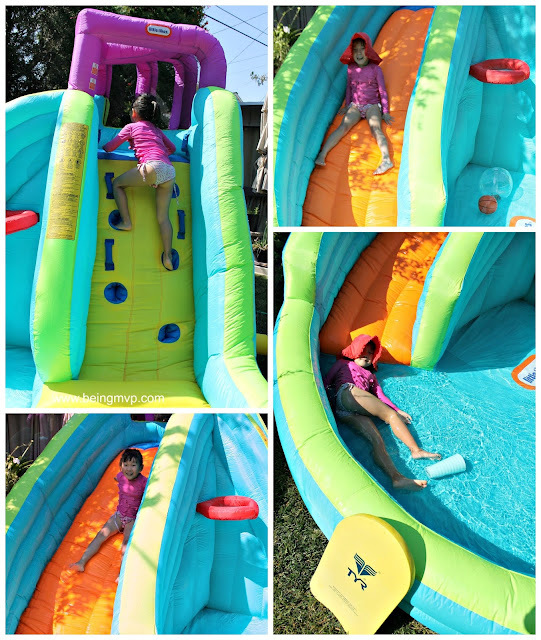 Don't let the heat keep you indoors this summer, stay cool with this amazing slide! One winner will Receive a Little Tikes Slam 'n Curve Slide! Oh what an awesome product! My grandson would have a blast with that. My boys would LOVE that! Seriously, they would be in that all summer long. Looks like so much fun, my kids would love this in the backyard!! That looks like a blast! My little boy would probably spend ALL DAY LONG playing with this!! Blowup things such as this are always huge hit in the summer! I like how it has a little pool area. My family would LOVE this! it looks SO fun and perfect for summer! OMG, I need this! Looks like so much fun and the kids would get so much use out of it. This looks like the best blowup toy for summer! My kids would have a blast with it and would spend hours playing on it! That would be so much fun in the sun. It would be great to have one of these so the kids could cool off in the yard. This is amazing!. My friends kids would be in heaven if they had this. I will have to share this with her. The girls do have a birthday coming up. My girls would love this and the basketball hoop is a cool feature! My kids would have so much fun on this! I will have to look into getting one for this summer. My kids would have a blast with this!! I had no idea Little Tikes made these! Can I please be a kid again so I can play on this slide?? Wow! I wish I had a yard for this! My kids would absolutely love to play on this every day! Oh my goodness. That looks like so much fun. I bet my kids wouldn't come inside all summer. wow! my kids would want to be outside on this all day and night! what a fun summer toy and i love that it is easy to set up and take down. wow! my good friend needs this for your 2 children. I am gonna share. Thank you so much. She is gonna love this. Oh, how fun! There's a lot you can do with this since it's not just a pool and has the slide and the basketball hoop. You are going to be using this a lot! How fun .i bet the kids would love to get this for the back yard. Gosh how cool is that!?! I bet you are going to be "the" house to visit this summer! Great way for the kids to have some fun and cool off too. This is every kid's dream! My kids would love this. This looks so fun and safe! Makes you want to be six years old again! I think this will go on my wishlist fo this summer . Such a fun product! I have nine grand kids that this would entertain all day! This little tikes slam n curve slide looks so awesome! My son, nieces and nephews would have a lot of fun with it! We would also love to have the 2-in-1 Castle Climber. I love the Lalaloopsy Toy box! Id like to have the 2 in 1 wet and dry bouncer and the classic whale tetter totter. Not necessarily a toy...but we would love the 'Fold n Store' table w/umbrella. It would be the perfect place for a mid day snack or dining al fresco! What a blast !!!!!!!!!!!!!!!!!!!!!! I would love to have this in my yard!!! This is an awesome giveaway. Thank you for the review. This would be lots of fun. What an amazing giveaway!!! We also would love the Little Tikes® Tunnel 'N Dome Climber! I like the Gravity-Free Tee for my son! The Climbing Towers Playground is another summer fun toy the kids would LOVE! I want the little tikes cottage!!! I commented Under Youtube Review. I would love to have the Little Tikes Picnic on the Patio Playhouse for my grandkids this summer. Another Little Tikes toy I love is the Cozy Coupe, this is a classic toy every kids needs! The Fish 'n Splash Water Table is really cute, my youngest 2 would have a blast with it. We would love to own the Picnic Patio Playhouse. So cute. My kids would love the Treasure Hunt Sand & Water Table. My girls would love the Sand and Sea Play Table! If you think about business then you should think about our water slide. Every kids like water slide game. If you rent water slide and start your business with it, it is sure that you will successes.